Trameka Pope, a Chicago high school senior, gave birth to a baby girl the summer after eighth grade and decided then that she wasn't going to become a statistic. Now she has more than 26 college-acceptance letters and has been awarded more than $600,000 in scholarships, People magazine reports. "I was told that God don't make mistakes and he wouldn't give anyone a child who wasn't ready for one," Pope told Fox 32 News. Pope told the news station that at one point during her struggles, she and her family were homeless. But that didn't stop Pope. She was a cheerleader, worked at a grocery store and is a member of the National Honor Society. 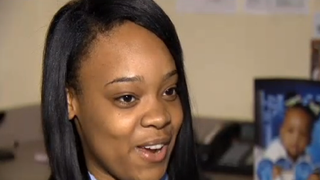 She is also the valedictorian of the graduating class at Chicago's Wendell Phillips High School, and she has already taken college-preparatory courses at a local college. "I didn't give up. I pushed myself hard. And my baby motivated me every day because I wanted to provide for her and I also didn't want to be a statistic," Pope said. Pope's school counselors helped her apply to college, and staff members from the Chicago Public Schools took her on college tours. Her social worker, Dawn Jackson, described Pope as an example of how teen parents can persevere and still do incredibly well in school if they put in the effort and are helped. "No matter what background you come from, it doesn't matter if you have a child as a teen, no matter what people say about you, you still can, you can make it and you can become something," Jackson said. Pope plans to attend Western Illinois University and hopes to get her Ph.D. in social work. Read more at People and Fox 32 News.